According to records, Bangladesh's forest cover has shrunk to a meagre six per cent from 20 per cent in 1927. The southern mangroves are perhaps the only considerable patches of natural forest left in the country. Who is to blame for this? Seen through the lens of the international media, Bangladesh is a damned country. Thousands die virtually every year in floods and cyclones. It is also an amazingly lush green country, seemingly covered with fertile tracts and forests. 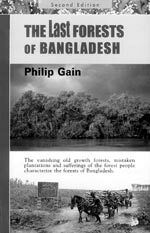 But that doesn't quite paint the true picture, which can be found in this book, subtitled, "The vanishing old growth forests and sufferings of the forest people characterize the forests of Bangladesh." The government and international financial organizations blame poverty and over-population. This book says it is the state, with its unscrupulous exploitation and production-oriented forestry practices that are responsible. This second edition contains an added chapter and numerous updates.